The post John Migliaccio named NESPA 2015 Certified Building Professional of the Year appeared first on The Pool & Spa Place. 2015 APSP Awards Congratulations to Metro Board Member, John Migliaccio, who is this year’s recipient of the APSP Certified Building Professional of the Year! The CBP of the Year Award is a peer nominated award given annually to one CBP who has advanced the pool building profession through outstanding achievements and dedication to the industry. In addition, John, has also been recognized as a 2015 APSP Fellow. This is the industry’s highest professional award for distinguished contributions in raising professionalism in the aquatic community. Way to go John! The post Introducing the Jacuzzi 500 Series………………… State of the Art Meets the State of Relaxation appeared first on The Pool & Spa Place. As Jacuzzi dealers we’re used to seeing some type of innovation with each new model year, but what Jacuzzi has brought to the table in 2015 has taken the hot tub to a whole new level. The introduction of the J-500 created quite a buzz and we couldn’t wait to get one on our showroom floor. It’s finally here and we are impressed, really impressed. Modern design, unparalleled hydro massage and cutting edge technology come together seamlessly in the new J-500 series from Jacuzzi. First, we love the wider variety of seating provided in the J585 and J575, allowing a perfect fit for people of all heights. Also, only on J-500, is the PowerPro FX Medium directional jet which concentrates a stream of pulsing water working deep into your hip muscles completing a therapy seat that provides a full body massage from neck to feet. 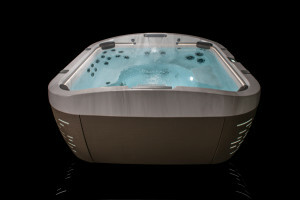 It was immediately evident that J-500 looks like no other hot tub we’ve seen before. The Curvalux exterior combines maintenance free durability with a sleek elegant design. The skirt was actually molded from high end outdoor furniture for a sophisticated, seamless look. This hot tub even has exterior lighting, yup another first. It’s integrated right into the skirt, creating an incredible wow factor. The lighting gets even better inside the J-500. ProEdge interior illumination is customizable. Featuring 7 colors and 3 intensity levels this hot tub’s perimeter lighting and illuminated dual waterfalls allow you to set any mood. Relaxation, romance or party – create the atmosphere with the push of a button. Actually, with the J-500 there are no buttons. Touch screen technology has made its hot tub debut. The J-500’s ProTouch control is the first in the industry to integrate glass touch screen controls on a hot tub, but the convenience and doesn’t end there. Yup, there’s an app for that. The ProLink app allows you to control your hot tub from anywhere in the world. Choose your lighting, fire up the jets and set your temp before leaving work and come home to the ultimate mood adjuster. The post The Pool & Spa Place, Cranbury Pool Builder, New Web Presence appeared first on The Pool & Spa Place. Thank you for visiting our new Web presence! The Pool & Spa Place is a central New Jersey inground pool builder and Jacuzzi spa dealer serving the Monroe, Cranbury, West Windsor and Robbinsville areas, who would love the opportunity to earn your business. We recognize building a pool is an important decision, as is deciding who should build it. We take pride in providing our customers with the best products and best service at a fair price and welcome you to view our customer testimonials to see what our customers have to say. 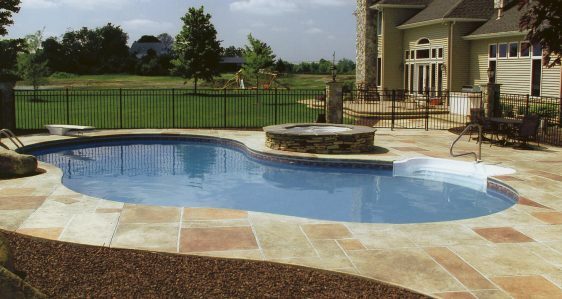 Please feel free to browse our Website and learn more about our custom inground pools, Jacuzzi spas, pool maintenance services, as well as our quality pool and spa products. For more information, please browse our new Website, like us on Facebook, subscribe to our blog, or visit us on Google + and YouTube.